Overview - From Academy Award-winning director Brad Bird and the amazing storytellers at Pixar Animation Studios comes RATATOUILLE, the most original comedy of the summer about one of the most unlikely friendship's imaginable. The film's protagonist is a rat named Remy who dares to dream the impossible dream of becoming a gourmet chef in a five-star French restaurant. Together with a down-and-out garbage boy named Linguini, the pair carves their own imaginative path to becoming the greatest chef in Paris. When Pixar first announced 'Ratatouille' as its next project, I was skeptical. 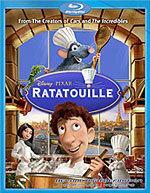 An animated movie about rats cooking in a French restaurant? It sounded completely unappetizing and, to be blunt, like commercial suicide. How do you sell such a potentially sophisticated and just plain foreign concept to the American masses? As big a fan as I'd been of the company's stellar past work, I just couldn't see this one as being a hit. But, o ye of little faith! 'Ratatouille' proved to be the little rodent that could, not only surmounting its marketing challenges with ease (it's grossed nearly $600 million at the worldwide box office, and still counting), but proving to be 2007's most delightful surprise. It's an absolutely enchanting concoction -- a movie so imaginative and delightful that yes, I would rank it right up there with the absolute best that Pixar has yet produced. 'Ratatouille' is deceptively sublime, a movie that appears as light as a souffle but is really quite the sophisticated dish. Although the concept of a talking critter movie is hardly anything new, Pixar has never been interested in churning out the kind of frantic, cluttered, pop-culture-referencing stew that usually passes for an animated movie these days (sorry, Shrek!). Instead, under the mindful direction of Brad Bird ('The Incredibles,' 'The Iron Giant'), we get a story that's downright literary, and a cinematic style that borrows from such a disparate bag of classical traditions that frankly it's unlike anything I've ever seen in a mainstream animated feature. Who else but Pixar could combine the slapstick farce of Charlie Chaplin, elegant visuals right out of a Seurat painting, and a Cyrano de Bergerac-inspired tale about a bunch of chefs and rats cooking together, and somehow make it universally resonant? In 'Ratatouille,' Bird returns to two key themes he also explored in 'The Incredibles': the importance of pursuing excellence over mediocrity, and the always-unbreakable bonds of family. 'Ratatouille' frames its story in the most unlikely of places, however, and with the most unlikely of heroes. 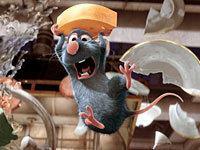 Remy (voiced astonishingly well by comedian Patton Oswalt) is a blue rat blessed with one very cultured palate. He's smart, fastidious, talented and filled with grand dreams of being the world's greatest chef -- much to the consternation of his slacker but still good-natured brother Emile (Peter Sohn) and his grizzled father Django (Brian Dennehy), who both find his determination to create culinary masterpieces a sure sign of madness. Following an unexpected series of events that see Remy and his family evicted from their rural haven, the plot kicks into high gear, with Remy forced to escape through the sewers (in the first of one of many beautifully staged action sequences), and winding up in Paris. Following his nose as much as his ambition, he discovers a small restaurant once owned by the legendary chef Aususte Gusteau, whose famous motto ("Anyone can cook!") had an immediate influence on Remy. Sneaking in late one night to add a little spice to a soup, the next day the dish is suddenly a sensation. This leads to the film's odd-couple pairing, as the restaurant's completely untalented garbage boy, Linguini (Lou Romano), is pegged as the chef of the soup. Desperate to keep his new star job, Linguini employs Remy's services as a "ghost chef," which leads to a classic series of complications. Can Remy and Linguini find a way to work together and avoid discovery? Things get even more complicated after Linguini falls for the kitchen's beautiful Colette (Janeane Garofalo), and a particularly nasty restaurant critic (a terrific Peter O'Toole) begins asking one too many questions about the nature of the dish. 'Ratatouille' works on every level. It's funny and intelligent, wonderfully written and performed, and has an incredible visual zest and buoyancy. An exceptional attention to detail has always been a hallmark of the best Pixar films, and 'Ratatouille' is superlative even by their high standards. Bird, and his team of writers, animators and actors have fully conceived and executed a unique universe that feels alive and real. It's also a structural feat of engineering, with Bird effortlessly alternating between rodent and human perspectives. This is masterful storytelling, not just great animation or cute characters, and by the time 'Ratatouille's 112-minutes have flown by, we feel like we've only scratched the surface of this magical, fantastic new world. 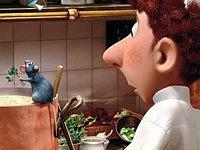 Ultimately, what impresses the most about 'Ratatouille' is that it dares to be original. Once again, Pixar has proven that it is not only by far the best producer of animated movies on the planet, but that it's a company that has no intention of resting on its creative laurels. Rather than xerox, they explore -- instead of 'Toy Story Part XVII,' we get 'Ratatouille.' I can only hope Pixar continues to nurture these instincts, because for me, they've never stepped wrong. 'Ratatouille' stands tall among a ever-growing canon of Pixar classics, and I can't wait to see what's next on their menu. In my recent Blu-ray review of 'Cars,' I raved about that disc's five-star video quality. It's a tough act to follow, but somehow 'Ratatouille' looks even better. Pixar and Disney present the film in 1080p/AVC MPEG-4 video at its original theatrical aspect ratio of 2.40:1, and every single pixel is, well, perfect. This is simply the best high-def presentation I've ever seen of an animated feature. A direct digital-to-digital conversion, the transfer is as delicious as the greatest French feast you've ever had. The film's color palette is just gorgeous, with delicate shades of pinks, blues and greens contrasting wonderfully with deeper crimsons and purples. The finely-tuned shadings and gradients are so smoothly rendered that the image leaps off the screen. This is gloriously three-dimensional animation, and the sense of depth and texture to the image is exactly what high-def is all about. All other elements of the presentation are superb as well -- blacks, contrast and sharpness are spot-on. Likewise, the encode looks perfect, with no pixelization, macroblocking or banding/posteriztion. Simply put, the picture quality of this Blu-ray edition of 'Ratatouille' absolutely flawless. Like the video, the uncompressed PCM 5.1 Surround audio track (48kHz/24-bit) on this Blu-ray disc is also terrific. Where 'Cars' is all dynamic and driving, 'Ratatouille' is more warm and subtle, but no less engrossing. This is a perfect example of how fantastic great sound design can be even when it's not ramming you over the head with bombast. I hate to use silly cliches that sound like a TV commercial, but this soundtrack is not unlike a great fine wine. From every word of dialogue to the wonderful score by Michael Giacchino, it all just seems to slide out of the speakers. Completely constructed in the studio, it's just so clean and smooth. The use of surrounds is just as elegant. Atmosphere is king here, with transparent pans between channels and excellent spatiality, which delivers a constant sense of envelopment yet is never overpowering. And lest one think dynamics might be wimpy, low bass is certainly deep enough when needed (wait for the lightning bolt -- you'll feel it), and the robust highs are equally wonderful. And just as with 'Cars,' dialogue is perfectly rendered, and I never even thought of touching the volume button on my remote. With such great video and audio, Pixar is now two for two with 'Ratatouille.' Splendid! As was the case with 'Cars,' Pixar seems to have saved all the good stuff for the high-def version of 'Ratatouille,' with the exclusive Blu-ray content (outlined in the "HD Exclusives" section below) outshining the material carried over from the standard-def version. That's not to say that the material ported over from the DVD is bad in any way, but taken on its own, it's really quite slim for such a major new release. Things kick off with "Fine Food and Film." I found this a bit of a 14-minute oddity. Brad Bird and Thomas Keller (owner of the famously swanky eatery The French Laundry) are interviewed, and each talk about their passion for their respective art forms. This is an interesting discussion, and is often charmingly cute (especially as we see Bird and Keller preparing some food together as if Martha Stewart might walk in at any moment), but it's largely an aside, and not an actual making-of featurette. Next is a collection of three Deleted Scenes, running about 15 minutes in total. The trio of clips -- "Chez Gusteau," "Meet Gusteau" and "First Day" -- are nice little character bits, but not much more. As none of these scenes ever reached final rendering, they are presented here in rough animated form only. Finally, we have two great Pixar shorts. "Lifted" (5 minutes) originally preceded 'Ratatouille' during its theatrical run, and it's a highly amusing fantasy about a driver's education test in a UFO. As good as that one is, I actually liked the second, never-before-seen "Your Friend the Rat" better. This 11-minute mock-educational film is told in '50s style, with Remy and Emile giving us a comic history of the rodent race. This is a wonderful little short, and is a must-watch for 'Ratatouille' fans. 'Ratatouille' stands tall among the tallest of Pixar accomplishments -- it's adventurous, witty, visually captivating and utterly charming. This Blu-ray release is also fantastic, boasting absolutely perfect video and audio, plus a great package of extras. I've reviewed over 500 next-gen discs over the last year and a half, and not one has received a perfect five star rating overall, but there's a first time for everything and I'm happy to report that 'Ratatouille' is it. This is a must-own disc that no Blu-ray collection should be without.